Benefit from detailed ESG analysis of the respective bond and its issuer assessing the veracity of a given sustainability bond’s claims on its intended ESG impact. ESG assessments of Green, Social and Sustainability Bonds. It offers insights on how the bonds perform with regard to transparency and alignment with the Green Bond Principles, the ESG performance of the issuer, as well as the positive impact and risks related to the bonds’ use of proceeds. Bonds that are rated a or b on the rating scale obtain the “approved” status. The status provides an indication for investors who are looking for high quality and truly sustainable bond investments and provides a minimum threshold for inclusion into RI or thematic ESG funds, mandates and indices. The rating results are presented on the basis of a bond rating scale from a+ to d-. Alignment to the Green Bond Principles. Eligibility criteria the issuer has chosen for identifying the projects to be financed. 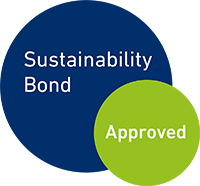 Trust Green Bond Services to ensure suitability for your responsible investment approach.